Kwanzaa is a secular African-American holiday created Dr. Ron "Maulana" Karenga. Kwanzaa is sometimes spelt "Kwanza" (or incorrectly as "Kwaanza") - and the name is ultimately derived from the Swahili phrase "matunda ya kwanza" which means "first fruits" and refers to a traditional African celebration. Dr. Karenga added the additional "A" to the word, to refer to African-American (as opposed to just African), and so that the word had seven letters to signify the seven principles of blackness. 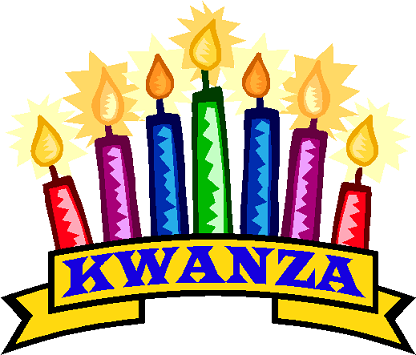 The Kwanzaa holiday runs from December 26th to January 1st, and was first celebrated in 1966. To strive for and maintain unity in the family and community. To define our common interests and make decisions that are in the best interest of our family and community. To build and maintain our community, and to make our brother's and sister's problems our problems and to solve them together. To look within ourselves and to set personal goals that are beneficial to the community. To do as much as we can to leave our community more beautiful and beneficial than when we inherited it. To honor the best of our traditions, to draw upon the best in ourselves, and to strive for a higher level of life for humankind, by affirming our self-worth and confidence in our ability to succeed and triumph in righteous struggle.